Introduction: While outcomes of laparoscopic Heller myotomy and Dor fundoplication for achalasia are excellent, outcomes for diffuse esophageal spasm (DES) are less predictable. We hypothesized that when dysphagia is the predominant symptom, a laparoscopic myotomy and Dor fundoplication would provide relief. Methods: We retrospectively studied 10 patients with DES and refractory dysphagia who had a laparoscopic esophagomyotomy and Dor fundoplication. Long-term outcome was assessed by telephone interview. The outcome measures were severity of dysphagia, regurgitation, chest pain, and heartburn before and after the operation. Postoperative dilatations, revisional operations, and use of antacids were also recorded. Results: Follow-up averaged 6 years (range 3-9 years). After myotomy, mean dysphagia scores decreased from 3.8±0.5 to 1.7±1.7 (p<0.01) and regurgitation scores decreased from 3.3±1.3 to 1.1±1.7 (p<0.01). There was no improvement in chest pain (1.2±1.4 to 1.1±1.6, p=0.7) or heartburn (1.5±1.7 to 1.2±1.6, p=0.9), although these symptoms were mild to start with. Dysphagia was completely relieved in 4 patients, and it was reduced to once/wk or less in 2 patients. Two patients required reoperation for persistent dysphagia, one after multiple failed dilatations. 70% of patients took antacids postoperatively. There were no major complications. 80% of patients reported sustained improvement in their swallowing, and satisfaction scores were good, averaging 3.0 out of 4. 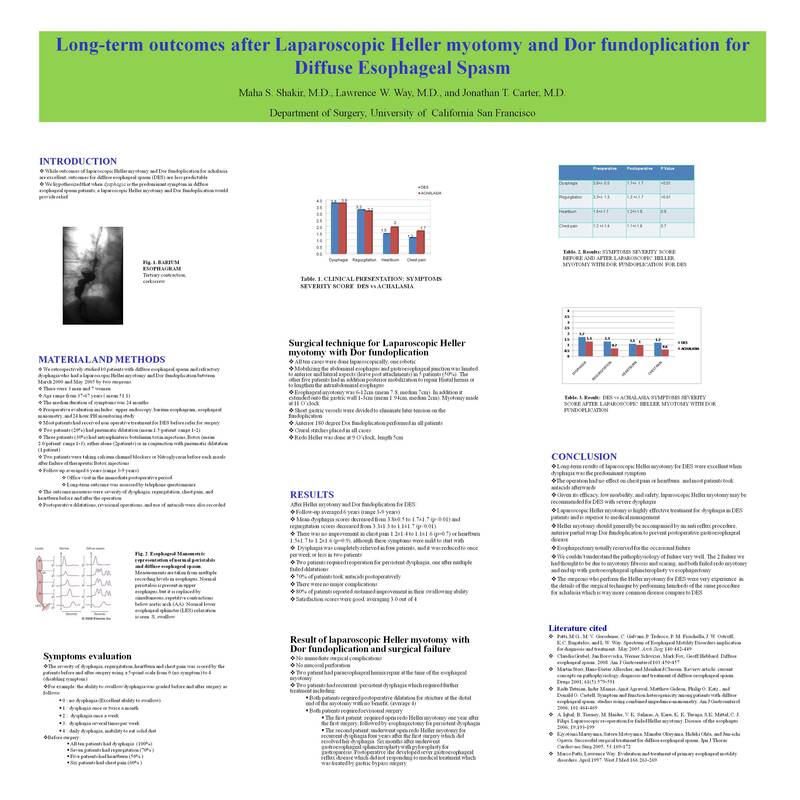 Conclusions: Long-term results of laparoscopic esophagomyotomy for DES were excellent when dysphagia was the predominant symptom. The operation had no effect on chest pain or heartburn, and most patients took antacids afterwards. Given its efficacy, low morbidity, and safety, laparoscopic myotomy may be recommended for DES with severe dysphagia.